As per the Content Marketing Institute’s report in 2016, close to 85% of B2B companies revealed the top priority of content marketing is lead generation. Essentially, the same goals and strategies underlie B2B and B2C marketing. A key ingredient in the equation is the target audience, which differs for these two types of marketing. While creating buyer personas for content marketing strategies, the focus is on the professional needs and goals of the target audience. On the other hand, B2C companies tend to focus on the personal needs of consumers. The key point of B2B lead generation strategies is deciding how to refine audiences and how to reach them effectively. So how do you actually generate B2B leads? For example, if you create relevant content for consumption, that’s just the first step. Additionally, visitors are attracted by ranking on search engines, sharing content on social media and digital channels. For content to actually work, you need a lead generation strategy that fosters engagement. For a lead generation to actually work, elements like calls-to-action are critical for every blog post-consumed. It can be the same CTA for each post or adjusted for broader target audiences. Using lead magnets like email IDs, discounts on B2B services or products or generating strategies that appeal to prospects is important. So, whether you’re looking to promote content through blogs, emails etc, the focus is on sending subscribers quality content to cash in. Social proof apart, laser-focused personalized content is the key to generating B2B leads to increase revenue. One needs to think about how to sweeten the deal. Conversion based copy incorporates content marketing and social media ads that are compelling. Offering social proof of purchase can work wonders for generating B2B leads, as well. There’s a secret to offering the right trigger to generate leads, and that is nothing, but personalization. Personalized intent popups can show your customers here to go. Motivating opt-ins can also build your sales leads B2B database. Even options like exit-intent popups offer a huge conversion rate for your lead generation program. Word-of-mouth referrals are the best customers. A referral source could also be a website sending clients your way through backlinks. This is when a trusted website refers customers back to the site. There are numerous means to build backlinks and foster trust. Cold calls and emails are hard to execute effectively. This is because there is no prior relationship with the company or person one is sending it to. So, you don’t get another chance to make a first impression. Work on your approach and outreach skills and you’ll get the leads. Here’s why SEO strategies matter, too, when it comes to generating B2B leads. Research has found 75% of internet users do not search beyond the first page. If one ranks high on search engine rankings or positions, lead generation is assured. Content needs to be keyword-driven, authentic and relevant. This is easily among the leading B2B lead generation tactics. Intent signal monitoring focuses on seeing every web page the target customer is visiting. So your B2B business gets real-time evidence of downloads, searches, forum discussions and product demonstrations being researched. While creating content for B2B marketers, one needs to pack in as much value as can be. Even if the secrets of the trade are shared, audiences can reward generosity by interacting with the firm. There are plenty of options ranging across articles, long-form guides, content round-ups, and infographics. Tools used to establish and promote brands can be used in B2B lead generation tactics, too. Social media convert followers to leads and spreads brand awareness. LinkedIn offers one of the best sources for B2B marketing, but other platforms like Facebook, YouTube, Twitter, and Instagram are also beneficial. In a B2B lead generation campaign, you need powerful calls-to-action, if you want to convert visitors to prospects. A great call-to-action is visible, uses specific language and eye-catching imagery. CTAs are also designed in different ways depending on the medium for lead generation. On social, there are certain ways to design CTA. On sites, there are others. Try split testing till you get the perfect copy, CTA and offer. 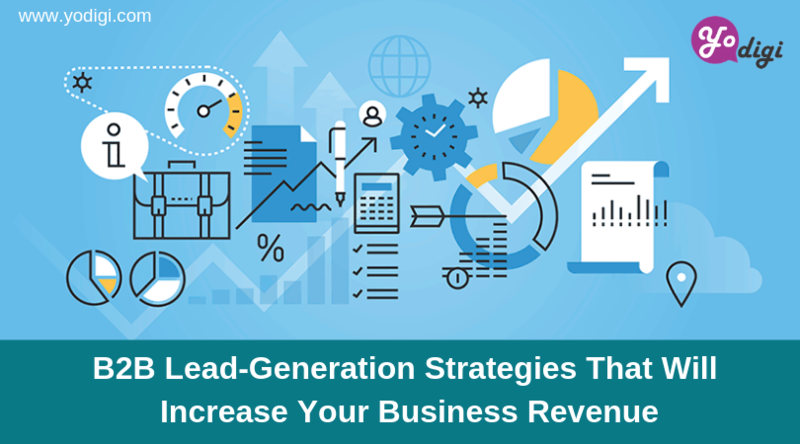 Creating effective B2B lead generation strategies need not be costly. Or time-consuming. With IT market leader Sankalp’s digital marketing solution, Digi, you can rest assured that each of these B2B lead generation strategies is deployed to increase business revenue. Whether it’s content, emails, social media, or lead generation methods like quizzes and surveys, digital marketing outreach was never easier, thanks to Digi.